Ultra creamy italian style risotto. No-one will believe that it is vegan! 75g | 1/2 cup cashew nuts , dry weight, (Soak in cold water for at least an hour or hot water for only 15 minutes). Add olive oil to a large sauté pan. Heat over a medium heat. When hot add the chopped green garlic and sauté gently for a few minutes. Add the arborio rice and keep stirring until it is all coated in oil and starting to make crackly noises. Add boiling water one cup at a time, stirring constantly. Only add more water once the previous cup has been absorbed. When you have added all three cups and the third cup is almost but not quite absorbed add the mushrooms and stir. Turn down low and put a lid on while you make your cashew cream. Add the drained soaked cashews to a blender or food processor. Pour in half a cup of water and the nutritional yeast. Blitz until completely smooth (this only takes a minute or two). Remove the lid from the sauté pan and stir in the cashew cream. 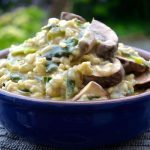 As soon as the mushrooms are tender and the risotto has warmed through following the addition of the cashew cream, it is ready to serve.